B.A. 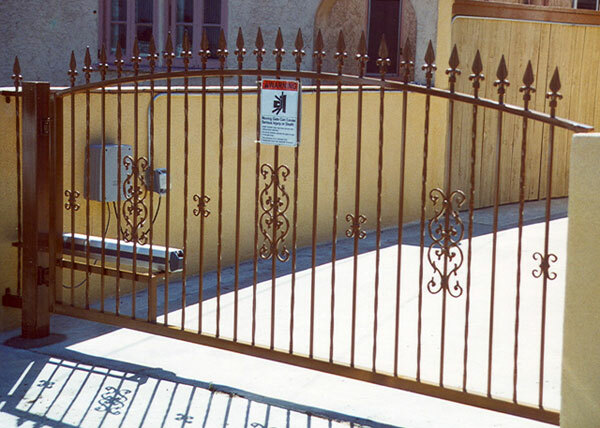 Ramirez & Sons Ornamental Iron Works, Inc. offers San Diego residential and commercial clients the best value in automated gate installation. We provide our clients with beautiful, long-lasting entryway and driveway gates that can be outfitted with the latest gate operator and access control systems. Our rates are competitive; we back all of our work with excellent warranties; and we provide excellent customer service. As a testament to the quality of our work, we have thousands of satisfied clients and a business built on referrals and returning clients. To help our clients get the automated gate they are envisioning, we offer free consultations and honest, expert advice. 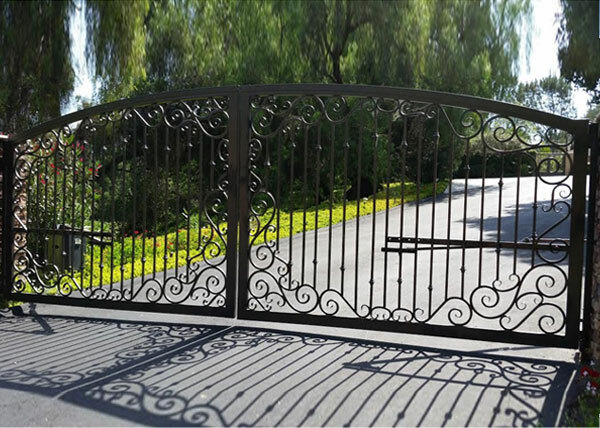 Because nearly everyone on our team has decades of hands-on experience and training, you can trust that we have the industry knowledge and artistic ability to ensure your new gate will be exactly what you want and more. Gates can consist of smooth or hammered pickets, rails, scrolls, circles, and squares, and embellished with crests, surname initials, or ornate castings, such as oak or rose leaves. 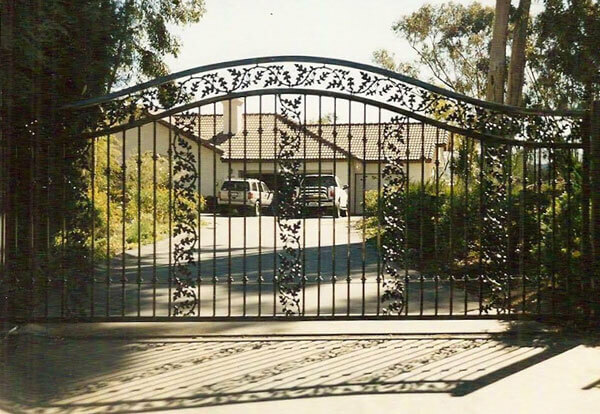 Our automated gates are hand forged out of ornamental or wrought iron and then meticulously welded, sanded, grinded, and buffed. We can also apply anti-corrosion treatments: either hot-dipped galvanization, metallization, or baked-on powder coat finish. Our powder coat finishes are available in hundreds of colors and we work with liquid epoxy finish for custom color-matching. Once completed and installed, we can integrate your choice of slide or swing gate operators, entry systems, keypad access systems, remote controls, and/or wireless keyless entry systems. We typically work with LiftMaster, Ram Set, and DoorKing, but can order and install any brand if there is something specific you'd like. Call the ironwork specialists at B.A. 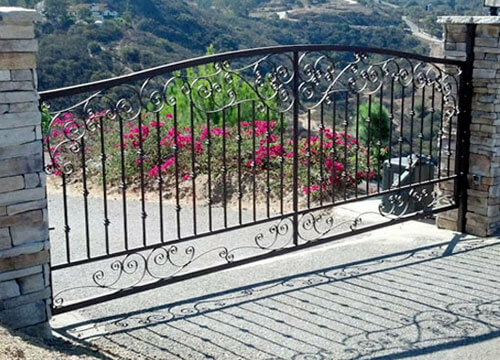 Ramirez & Sons today to start customizing your automated iron gate. We can either replicate a gate you've seen elsewhere (on a website, in a magazine, or while visiting a castle in Europe) or help you design an original gate that is based upon the look of your home or business, your style preferences, or a selection of photos. Online estimates are free, and we can begin installation as soon as three weeks after the order date. 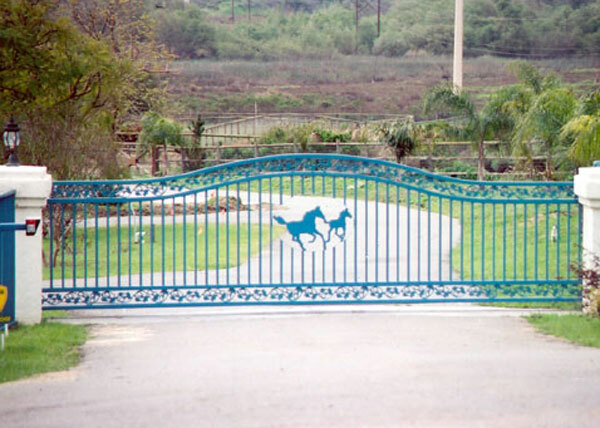 Automated or motorized gates typically take three to four days to complete, and are always backed by a warranty. Automated driveway gates can be installed on driveways of any size and be designed to complement the look of any home or business. Typically made from moderate to heavy-gauge steel. Gates can swing or slide open, and consist of single or double doors. Designs range from simple to the highly ornate: straight picket gates; arched or rounded, crown-top gates; gates with a family crest or surname initial; open picket gates with scroll work; etc. Option to add wood, copper, or brass backing for privacy or to create a unique look. Spears can be added for greater security or a decorative touch. Iron can be galvanized, metallized, and/or powdercoated for rust protection. Other optional features include motorized gate openers, intercoms, card readers, fire strobes, safety protections, keypad systems, electronic locks, and more. Two-year labor and materials warranty on steel construction. One-year service warranty and five- to eight-year parts warranty on automated gate systems. By integrating an automated entry system on a front entry gate, you can remotely control access and improve security. Ability to custom-build your gate in any size and design, from classic to contemporary. 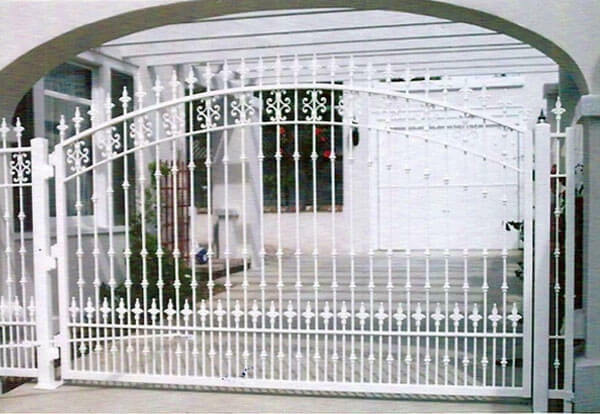 Gates are hand-forged from high-quality, moderate- to heavy-weight steel. Ability to add spears, scroll work, and forged or cast designs, such as oak leaves, rose leaves, squares, rectangles, and more. Privacy enhancements are also available, from screens to solid backings. Choose from galvanized, metallized, and/or powder coat finishes for rust protection. 100s of powder coat finish colors and liquid epoxy finish for a custom-matched color. 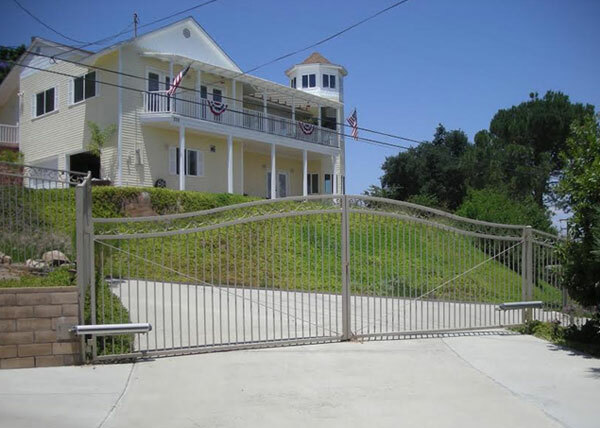 Ability to install motorized gate openers, keypad systems, electronic locks, and more.